I, for one, welcome our new, 5.2 million-cubic-foot, floating overlords? Can they put advertising on it? They used to have something like that parked out over the port here when I was little. My mom told me it was to watch for drug smugglers, but looking back it was probably weather. Is that a little wind-up key sticking out the side? Ha! It totally looks like that. That makes my phobia of blimps subside a tiny bit, thank you. And do what, I wonder. I'd hate to accidentally fly a light plane or glider near one of those. Might be mistaken for a cruise missile. i don't think a light plane or glider can get anywhere near 12 miles up. that's 63360', which is, iirc, about twice the cruising altitude of jetliners ("we are now at our cruising altititude of 30000 feet"). World altitude record for a glider is 49295'. Steve Fosset has been trying to raise that to 62000' for a couple of years. Interestingly both the standing record and current attempts are in basically standard gliders; a Grob 102 and DG505 respectively, with only minor modifications. These are aircraft your average local gliding club will have - I've flown both. Although Fosset did mention that the wing surfaces, well fucked, by flying that high and they'd have to trash the glider if they ever made it. First, your light plane or glider is a lot slower than your average cruise missile, which travels at around 550-600 miles per hour (a Cessna 172 cruises at 110mph on a good day). Second, these things will be sitting well above the service ceiling of commercial airliners, much less unpressurized craft. 40 million for a solar-powered weather balloon! I'm sure you could get one cheaper than that from Zeppelin GmbH (but then they're Germans, they're practically Filthy Terrorists). There are extreme difficulties in building something like this. It's never been done before and the pricetag fairly accurately reflects the problems that had to be solved to get it to this point. High altitude ballooning has been done before (most of the difficulties are in life support for the pilot), and airships are an even older technology. No, the 12-mile price tag reflects the inflated prices the US government pays defense contractors for everything. Why do you think the Iraqi war and occupation has cost so much? Do you think it would cost the Chinese that much to occupy a country? This isn't just high altitude ballooning or a common airship. This is the possitioning of a somewhat permanent and self powered platform at high altitude. And no, I don't believe it would cost the Chinese as much to occupy a country. For various reasons they wouldn't need to be nearly as careful with their actions, and it's MUCH cheaper to do a rough job on such a mission. It is just high altitude ballooning, and it is just a big airship. Describing the problem with different words doesn't make it a different problem. Jeez, you don't get much actual news in there do you? Describing the problem with different words doesn't make it a different problem. Just as describing it with the same ones doesn't make it the same problem. On the other hand it's those pesky differences that make it different. You haven't actually described any differences, you've just paraphrased what I said. 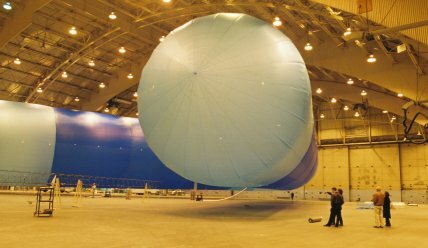 An airship needs only come down for resupply, and the limitation on it's ceiling is size. The specifications of this airship avoid these problems, and the technology is already established. Yes, its a semi-permanent, self powered, high altitude craft. Airships are capable of that now, limited only by size, crew and fuel. Of course, you're the expert on airships, you can describe the unique problems in building this one. We get your news, and a lot of other news besides, so we know what's missing from yours. But Dan Rather does have really lovely hair. High altitude station-keeping is a sufficiently hard problem the MDA has been willing to pay people to solve it. So the next time they solicit SBIRs on the subject, just send in your proposal. Efficient, lightweight, propulsion is needed for stationkeeping and point-to-point maneuvering of HAAs at approximately 70,000 ft. Desirable advances include development of very large, very lightweight propellers or alternate efficient, propulsion concepts. Winds at this altitude average near 20-40 knots most of the time. However, significant wind spikes of 100 knots are observed occasionally. The airship propulsion system must require no maintenance for a period of continuous operation over one year, have a mean time between failure of at least one year, and be able to accommodate both cases using the minimum amount of power possible, while keeping the airship on station as accurately as possible. Specific considerations include efficiency, maximum thrust, performance over time, mean time between failure, and number of moving parts. Technological innovations related to new propulsion concepts and propeller fabrication will be considered. Have you like, ever built something that worked? Anyway, if you do the research, you'll find none of these engineering problems are new or unique, although I expect that a number of the patents are held by non-US companies. I think your question is rather spurious. No I've never built one, few people have the money. I do know a bit about the subject however, quite enough to make me tedious at parties. Or here. Shall we drop this, I'm boring myself. I'm an airship enthusiast, rather like a motor racing enthusiast. I know rather a lot about the history, limitations and capabilities of airships, but I don't build them personally (unless you count models); that's a little beyond the budget of your average small contractor. JWZ might have had the money for small airship construction if he'd been keen on aviation instead of nightclubs, I don't. I don't want to be rude, but I really wouldn't feel comfortable working directly for the military of a foreign power with such a poor recent history of co-operation with the UN, and such a poor track record when it comes to observing the rules of war. Err, you're welcome mate. No hard feelings I hope. Not even going into how useless this is for fighting terrorism. What do they expect, a terrorist tank brigade creeping through Montana? When are these guys going to get over the cold war? Reckon the money would be better spent teaching CIA and FBI agents Arabic. Although, come to think of it, it's a lot further down than a satellite, you'd probably get much better resolution with a satellite quality camera. Which means you could use it to spy on the domestic population; read number plates, that sort of thing. You might even be able to use it with one of those face recognition systems. Big-Blimp is watching you. of course we know what it's going to be used for. John Ashcroft is watching you, in a no-pants kind of way. Do you feel dirty? I wanna play with it! Am I the only person who noticed that the flag on that blimp is backward? Am i correct in assuming that that bar along the right side is showing the altitude of the blimp, not the scale? Although I would have to say a 400-mile long blimp would be mighty impressive (well, as far as blimps go in inciting fear in our enemies). If they were really serious about using it to incite fear, they'd use a Stay-Puft Marshmallow Man instead. It's on the right side - it should be reversed (i.e. "flying with the wind.") Look at the patch on the right shoulder of a soldier or cop some time. Precisely. The flag is never to be shown retreating, which would be the implication if the stars were toward the back of the vehicle (or soldier or cop) from that side. Wow, I just found an absurdly comprehensive list of flag rules and methods. 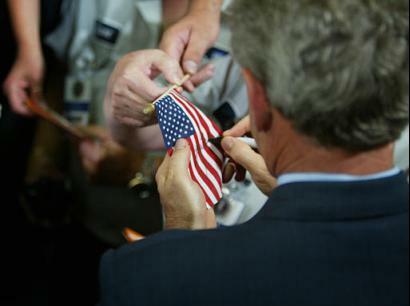 Well you're also not supposed to write on the flag either. I guess Bush really is working for the terrorists - defeating are bizarre rituals of patriotic loyalty that oh-so-ironically resemble those of the dirty communists. It is showing relative altitude. That's a satellite up there at 400, the airplane and this horrible terror are down near the bottom. ... and practically impossible to miss. This reminds me of Syndicate. Please tell me I won't be able to see it! If it had a big red coca cola sign on it, and a booming voice going "A new land awaits you in the off-world colonies... "
To think that, had Madrid been encircled by these, the bombers would have been stopped. Damn. ... Unless you've got an Arrow 2 or something similar. Hey look, you can launch it off the back of a truck.